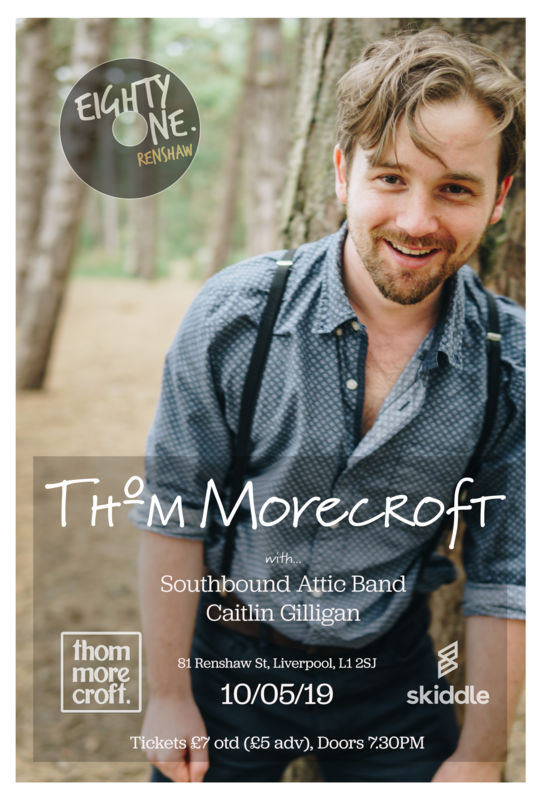 Played on BBC 6 Music by Tom Robinson and described by ex-editor of NME, Q, Mojo and Word Paul Du Noyer as “cheering and addictive”, Thom Morecroft is a British singer-songwriter from Shropshire, living in Liverpool. Born in Shrewsbury in the early 1990s and moving away to Liverpool where he was a student in the early 2010s, he became part of a vital, healthily populated scene of acoustic singer-songwriters in the north-west. He developed an idiosyncratic live performance and a distinctive vocal style. Thom has opened for the likes of Robert Vincent, Roxanne de Bastion, Beans on Toast and Will Varley and toured his EP and single releases in the UK and Germany. He is currently finishing work on his upcoming crowdfunded 14-track album ‘The Feng Shui & The Sushi’.